PayPal is considered to be one of the safeguarded and prominent payment services all over the world, especially for bloggers and freelancers. PayPal has been doing great work with monetary transactions as in banks where the receiver as well the sender needs to have a PayPal account which offers a free processing service. The widely recognized platform’s main advantage is its integration with the many third-party platforms and carts. It is also equally important to notice that there are many disadvantages with PayPal too. When there are many other better options for the payment process, why do you have to stick to the same payment method which has opened up more of disadvantages? 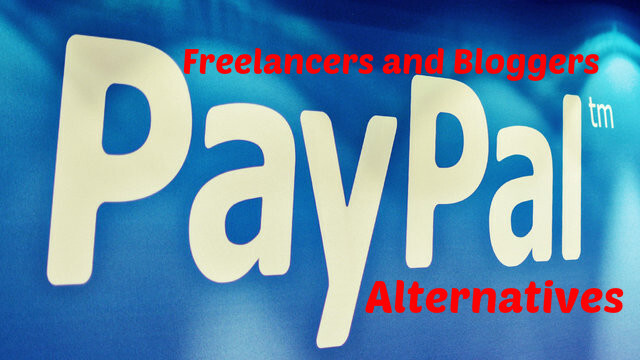 Let’s run through a few PayPal alternatives for Freelancers and bloggers. Bloggers and freelancers who are running a small business can make use of Payoneer as a tool to send and receive payments overseas. Payoneer is considered as one of the oldest global payment services. The best aspect of Payoneer is that it is now available in Pakistan, India and many more countries. With Payoneer US-based and European currency can be received. The main advantage of Payoneer is that the transaction fees are lower and more currency can be saved. Payoneer can be signed up for free, once the user has initiated a transaction of $100, they would receive a bonus of $25. Many bloggers and freelancers have opted for 2CO(2Checkout) for all the online transaction needs. With more of positive reviews, 2CO has out beaten PayPal and is considered a better option than it. The initial fee for signing up for an account in 2CO is $49 USD which is a onetime fee. 2CO puts up a commission fee of 5.5% on each transaction along with a $0.45 USD for each transaction. Formerly Moneybookers, Skrill is another best alternative option for bloggers and freelancers as the currency conversion rates are best. International money transfer can be accomplished for nearly 200 countries. There are also a number of events and offers that are available with skrill. Funds can be uploaded by means of local banks, Visa, master cards and more. Apart from the verification process which is a bit tough, the service is quite cool. When PayPal closed its doors, many Indian blogger and freelancers who earned online stood towards Xoom. The best feature of Xoom is that PayPal amount can be received on Xoom account. The Xoom has its operation across 38 countries anywhere and at any time. Formerly Alerpay, Payza is a new site which facilitates online transactions and has all the features as in PayPal. Business account or free account can be created depending upon the needs. Sending money across the globe is free and is accomplished in seconds. When business is considered, online payments is accepted from over 190 countries. The site is secured and is free from fraud intervention. The site is free to sign up and there are no monthly or yearly fees to be paid. Google Wallet is another way to send, receive and manage transactions online and the main advantage of google wallet is that payments can be achieved with just a tap. Google wallet can be used as a digital wallet which helps to store debit cards, credit cards, as well as loyalty cards for the transaction of currency from friends, family and more. Money can be sent to your friends, and family by means of Gmail address. Here currency can be funded from Google wallet bank account, balance, debit as well as credit cards. The main advantage of Google Wallet is that it is associated with Google account and has rounded the clock fraud monitoring. The main disadvantage is that it is restricted in the US and is less accepted when compared with PayPal. The wallet is free to use but users require paying a standard transfer charge when making used of debit or credit cards for transmitting money into the wallet account. Stripe is another way bloggers and freelancers make use of to receive payments from your customers. Stripe is considered as the best alternative to PayPal and it is also important to mention that stripe accepts many modes of payment such as American express, JCB, Master card and visa. The beneficial fact of a stripe is that it can process nearly 100 currencies. To receive payments from strips, businesses should be based on UK, Ireland, Canada, United States, Australia, Finland, Belgium, Germany, Austria, Switzerland, Sweden, Italy, Denmark, Spain, Norway, Belgium, France, Luxembourg, Netherlands, and Switzerland. It would be about 2.90% to 0.30% of commission for each transaction. The main advantages of strips are that it is mobile integrated, any country can be the source for sending payments and simple plugins are utilized. Another new alternative for PayPal is Dwolla which is a payment service and is considered a basement to send currency to ones on the web. Normal users can use Dwolla for sending and receiving payments and in the same manner, business people can make use of Dwolla for receiving money from customers. The best feature of Dwolla is that money can be sent to LinkedIn connections, email attachment, phone numbers, and followers of twitter and business that involve Dwolla. Mass pay is another astonishing factor of Dwolla which assists you is achieving thousands of payments at a time. Until October 2013, Dwolla was also involved in buying and selling bitcoins. The main advantages of Dwolla are that it is a free service which has a very low transaction fee, the user interface is simple and supports Android as well as iOS. The email address and phone numbers are the information shared and hence identity risks are avoided. The disadvantage is that when money needs to get transferred from Dwolla to a bank account, it takes about 3 days and also the acceptance is a bit low than PayPal. The main key motto of WePay is enabling customers to make payment without leaving the site. A virtual terminal is created with WePay for processing payments. Implementing WePay needs the user to possess some technical knowledge as it deals with API based technology. The simple service and the best features are few aspects which make the service familiar. International cards are also accepted and supported by WePay. For 2.90%+$3.0 credit card payments, 1%+$0.30 payments are charged. For merchants and small business, Selz can be the right choice. Freelancers and bloggers can find Selz the best way as they can sell anything through their website. Selz is one perfect choice to receive currency from customers. Web-based professionals, bloggers and many other services make use of Selz. For ones who are making use of WordPress site or blog can make use of Selz WordPress plugin for installation. When a comparison is made with PayPal and other prominent methods Selz is one perfect choice for selling of digital products. A commission of 5%+$0.25 is charged by Selz as a commission for each transaction. The main advantages of Selz are that it supports across 190 countries and easy to use and is a perfect choice for digital downloads. When disadvantage of Selz is looked into it is not available in main countries such as Pakistan, India, Vietnam, Indonesia, Nigeria and more. Amazon is another alternative to PayPal for bloggers and freelancers which are offered from the famed web giant Amazon. The gateway for payment can be Amazon which is a single platform with varied users such as developers, businesses, customers, and more. The purchasing chore of the site has been simplified with online purchases section, where payment procedure is available on the site. Apart from all those aspects, WebPay from amazon assists the users to send, receive money, merchants can also make use of it as there are features useful for merchants. The main advantages are that it is from Amazon.com and widely accepted. The main disadvantage is that this facility is not available for non-US residents. Amazon payments are completely free, where users can send and receive money without hassles. Square is another best alternative for PayPal, the best part of the square is that it comes with a card reader which makes a perfect working condition with iPhone, iPad as well as Android smartphone. Online stores can be created with a square where purchases can be done by the customer. American express, Visa, Master card, discover and more are supported by Square card reader. Square has also initiated receive payments through Apple pay by 2015. When E-junkie is taken into account it is one of the oldest online platforms for payment which is blended with 2Checkout, PayPal, Google checkout and many other payment sites. There are no setup charges or so, but a monthly fee needs to be paid which depends on upon few aspects such as selling of products and storage space. The buy now and checkout button can be used to integrate with website or blogs. Visa, Master card, bank account and PayPal can be used. Pop money is another best service which works with the banking security system and is also a free personal payment service which is a part of many top financial institutions in the country. With Pop money currency can be transferred electronically from the savings account to any other person in the country who has a bank account, phone number or email address. Funds are made to deposit in a very simple manner if the receiver has an account with the ones working with Pop money. Propay is one of the best service and easy to use option where small sellers and business can achieve credit card and debit card payments across the globe. The fee structure for this service is quite simple with no gateway charges, simple fee structure, low annual fee, no contracts, and no monthly charges. Blue snap is another option for payment for online merchants where they sell physical goods, and for selling digital music and games. The global reach has made the service a perfect choice and famed which is present in about 145 countries. The payment options are perfect and it also handles subscription billing and allows merchants to offer deals and promotions. Brian tree is yet another alternative for PayPal for accepting payments in the mobile app or through a website. Per transaction it costs about 2.4% to $.30, which gives an unlimited access to the transaction along with an option for unlimited access. The main advantage of Brain tree is that it has no transaction fee or monthly fee. If the user has a membership site it would be beneficial for a recurring billing purpose. By this way, these are a few alternative options for PayPal for blogger and freelancers to make transactions without hassles from across the globe. Each and every service has its main advantages and disadvantages which should be run through and detailed choice selection is important. picking the one which is important and best beneficial use for you can be the right way to use a particular service.